Posted on 14, October 2016 by EuropaWire PR Editors | This entry was posted in Aviation & Aerospace, Germany, Italy, Switzerland, Transportation & Logistics and tagged helicopter, Leonardo-Finmeccanica. Bookmark the permalink. ROME, 14-Oct-2016 — /EuropaWire/ — Leonardo-Finmeccanica shows continued strength in all civil helicopter markets. The company announced today the signing of a contract with Centaurium Aviation Ltd. of Switzerland for an AgustaWestland GrandNew light twin engine helicopter. The signing was performed during an official ceremony held at Helitech, Amsterdam. This aircraft is scheduled to enter service in spring 2017 and will be operated by Mountainflyers for heli taxi services from Bern Airport. With this GrandNew, Mountainflyers will be able to serve a wide range of destinations across Switzerland and Europe, establishing Bern Airport’s first twin engine VIP helicopter transport service. The GrandNew model also confirmed further market success during Japan Aerospace in Tokyo. 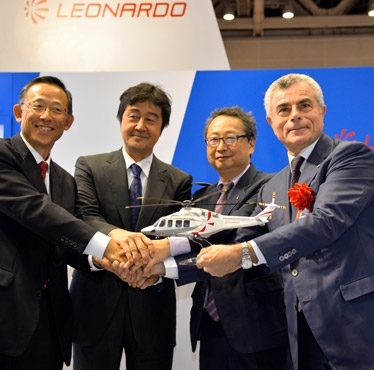 Leonardo and its distributor Kaigai Corporation announced a further expansion across the Japanese light twin helicopter market with an order by an undisclosed corporate customer for one helicopter to be used for executive/private transport. Additionally, two additional GrandNew helicopters have been delivered to Shizuoka Air Commuter Corporation and Kagoshima International Aviation to provide Emergency Medical Services (EMS) in the Prefectures of Niigata and Kagoshima, respectively. These recent successes further expand the presence of the GrandNew in the Japanese market where more than 80 AgustaWestland AW109 series aircraft have been sold to date to perform a range of missions including EMS, law enforcement, executive/private transport and Electronic News Gathering (ENG). Leonardo and its distributor Mitsui Bussan also announced at Japan Aerospace the selection of the AW139 by both Nippon TV and Chukyo TV for Electronic News Gathering (ENG) missions. These selections follow the joint announcement made with Mitsui Bussan at the Farnborough International Air Show in July foreseeing the delivery of the 50th AW139 helicopter to Japan by the end of 2016. At Helitech HeliService International GmbH signed for one AW169. The aircraft will be delivered in 2017 to undertake offshore windfarm support missions in the North Sea. These aircraft add to the first AW169 ordered by the customer in late 2015, and handed over this summer, which marked the first customer of the type for this application in Europe and the entry of the all new model into the German helicopter market.